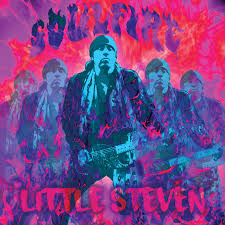 Steven Van Zandt returns after a long absence to cover some of the material he wrote for Southside Johnny & The Asbury Jukes - "I'm Coming Back", "Some Things Just Don't Change", "Love On The Wrong Side Of Town", "I Don't Want To Go Home" and "Ride The Night Away". To be perfectly honest, all of them are more than acceptable - horns to the fore, of course, but, as we all know, Van Zandt is no Southside Johnny vocally. I prefer the Southside Johnny versions to all of them with the possible exception of "Some Things Just Don't Change" which originally suffered from bad production on Southside's "This Time It's For Real" album. Actually the same can be applied to "Love On The Wrong Side Of Town", to a slightly lesser extent. 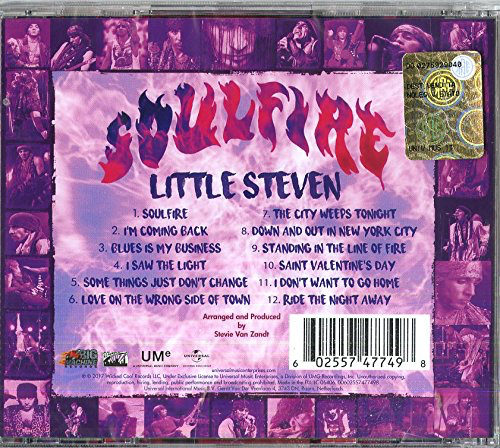 That said, Steven's voice seems to have deepened with age and is considerably less "whiney" and more gravelly, meaning he sounds more like Southside these days. Regarding the original Van Zandt tunes - "Soulfire" could well have been written for Johnny as well. "Blues Is My Business" is a great bluesy, horn-driven rocker and Van Zandt does his best to sound just like Southside. He almost pulls it off here too. Good effort. "I Saw The Light" sees Steven on great form, this could have been from Southside's "Hearts Of Stone" or Steven's own "Disciples Of Soul". "The City Weeps Tonight" is a pleasant enough, but inessential 50s doo-wop pastiche. "Down And Out In The New York City" starts out like a mid-70s disco intrumental and ends up like a Southside Johnny album track. Interesting enough. "Standing In The Line Of Fire" is very much from "Disciples Of Soul" territory. Rather like the similarly-titled "Lyin' In A Bed Of Fire" from that very album. "Saint Valentine's Day" sounds just like 1977 era Bruce Springsteen. Working with The Boss for so long has clearly rubbed off on this one. The horns attack and "wall of sound" is as raucous as always. The trick is listen to this stuff in short bursts or on occasions when you're lively, before going out for the evening is ideal.